dream, praise, express concerns, and offer suggestions. *"Who is responsible for what?" especially since there are decisions that need to be made in as soon as 30 days. and will be deciding on sub-committees related to all aspects of the renovation. The construction crew is currently removing asbestos from the building so it is completely off limits during this time. The contractor is feeling confident that by the end of April, the church office in the building will be up and running. Until then, the temporary church office will continue to function in the mobile office in our parking lot. Mostly we are in a holding pattern, waiting on the engineers and the insurance company. A number of people have come by the church getting information and evaluating. The engineers were there a couple of weeks ago. There have been several “walk-throughs” with Belfor, various sub-contractors, electricians, plumbers, remediation specialists, and the insurance company. A dry cleaning company has been there to evaluate all the “soft goods” i.e. the pew cushions, chairs etc. What we have been told is that after getting a bid the insurance company will decide whether to clean or replace. The same thing is true of the electronics in the church. Although it may not be possible to clean electronics and certify them safe. The insurance company has been working with the church office to determine what our loss of income was for January and we should be reimbursed for that. Work has been happening at the church in the meantime. Everything has been packed away to either be disposed of or cleaned. They moved out all the pianos and took very good care of the Steinway. The two containers in the front of the church contain the pews. They have had air scrubbers running constantly since the fire. Some demolition has occurred as they are remediating the asbestos. The janitor’s closet, storeroom, the diamond room and the family room are down to bare walls. 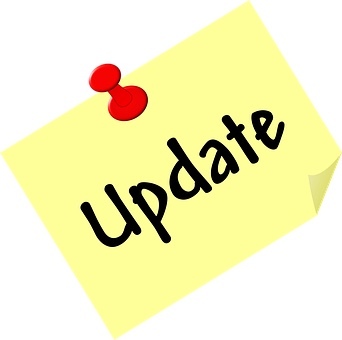 Unfortunately, we have not been given an estimate as to how soon they will be done, but we do have an unofficial estimate that we can be back in the office area in April. As we get more information, we will share it with you. The goal is to give an update every week. and replacement of loss of income. told us the specific amounts they will be designating in these areas. Well, the month of January has been sort of a wild ride for the church, hasn’t it? On Wednesday, February 9th, during choir practice, choir members smelled smoke and discovered there was a fire burning in the janitor’s closet. The Fire Department was called and arrived just in time to prevent the whole building from burning. The actual fire damage was only in the janitor’s closet behind the kitchen, the storeroom next to it and the hall ceiling. Unfortunately, smoke went throughout the building and as a result, we will not be able to use the building for probably six months. The fire was accidentally started by a member of the church. It was not intentional and the person involved had no idea that this would happen. As we move on, we are going to be faced with some challenges. Our building was built in 1948 and building codes have changed in the last 70 years. According to the city inspector, anything that is touched has to be brought up to current code. That means all of the electrical and all of the gas piping. They have not said anything about the water pipes yet, but I am waiting for it. And there will be asbestos and lead remediation. Also, a good deal of our electronics will have to be replaced. The good news is we have very good insurance. We are waiting for the insurance company to determine the damage and needed repairs. Then the engineers will produce a budget for said repairs and we should receive a settlement of the reimbursement value from the insurance company. We have hired Belfor as our remediation contractor. They have done an excellent job hiring electricians, plumbers and other specialists to assist with the process. They are a national company and have a national account with our insurance company. A BIG plus is that we have contracted with Barrish Pelham to do the engineering. As I write this, I am in our temporary office watching them remove damaged items that will be discarded and other items that will be cleaned or repaired. While we have been ‘churchless’ Hope Lutheran Church has graciously invited us to join their worship service and Temple Bat Yam has welcomed us to gather in their space. This is a difficult time for us, but if we approach this with God’s help, we will in the end be a stronger church and witness for Jesus by the time this is done. The fire at the church has turned a number of things upside down and caused angst and uncertainty. We have had to be flexible with schedules and find new locations to worship, hold meetings and continue to serve the community. There is so much good news though…we have been welcomed into other congregations in our community, Temple Bat Yam and Hope Lutheran. Many other churches have reached out to see what they could do to help: The Church of Christ-Science, Sierra Community Church and Tahoe Community Church have offered prayer, office space and sanctuary space. The South Tahoe Board of Realtors has offered help, as have many other secular organizations in the community. Our church will be okay. and helped to make things run as smoothly as possible. Bread and Broth, the Food Pantry, the choir, our spiritual formation programs and the children’s ministry continue with little interruption. We were able to find a temporary home for the Friday serving of Bread & Broth at Saint Theresa’s Church and Tahoe Wellness Cooperative has provided space in their community center for the Phoenix Food Pantry. We believe that both of the Hispanic Churches have found temporary homes as well. Belfor, our restoration company, and Church Mutual, our insurance company, have been a tremendous help. We have a portable office in the church parking lot, so we can continue to conduct our business during this transition period. In the next 3 to 4 weeks, Belfor, along with an engineering company, will be creating a plan that outlines the scope and cost of the rehabilitation that will be presented to our insurance carrier. We are looking forward to the church building being rehabilitated, with up to code electrical and gas lines, new furnaces, carpeting, paint and décor. So, although we had a fire, we have much to be thankful for…no one was physically injured and although the temporary situation can be trying at times, we are all still able to come together as the Body of Christ and worship our Amazing God!